Seeking Order in Anarchy offers insights into both the theoretical foundations and the real-world outcomes of multilateralism in world affairs. 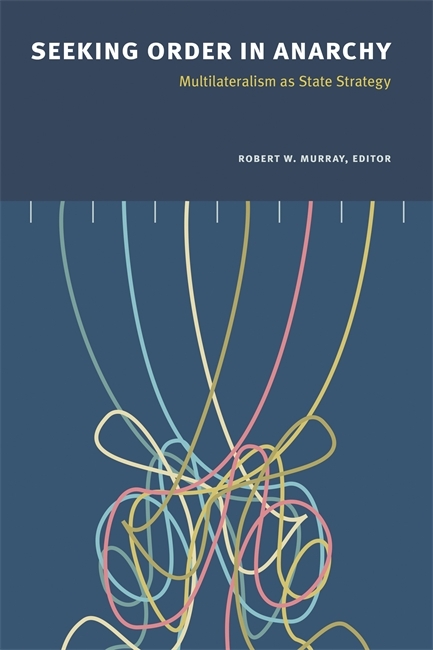 Recognizing that Tom Keating’s theories, though rooted in Canadian foreign policy, have a broader application in international relations, Robert W. Murray has assembled an array of interpretations of multilateralism and case studies examining its practical effects. Drawing from the insights of fourteen noted scholars and featuring an essay from Tom Keating himself, the volume examines the conditions that encourage states to adopt multilateral strategies, and the consequences of doing so in the context of increasingly complex global politics. Seeking Order in Anarchy is an important book for scholars, graduate students, policy makers, and anyone interested in how multilateralism functions in today’s world. Robert W. Murray is vice-president, Research with the Frontier Centre for Public Policy and an Adjunct Professor at the University of Alberta in Edmonton. For those engaged in re-engineering Canada’s foreign policy, Seeking Order in Anarchy: Multilateralism as State Strategy, a splendid volume edited by Robert W. Murray, offers helpful perspective… The authors highlight a distinctive Canadian scholarship of international relations— literate, analytically acute…. And the great Canadian scholar Tom Keating contributes a fine set of conclusions seeking to reconcile and illuminate the idea and often imperfect practice of multilateralism. They say Cape Buffalo ward off predators by instinctive mobbing behaviour. Many buffalo will join to protect the herd. Among nations, this is called 'multilateralism.' It sounds co-operative and altruistic, but in practice can be narrow and cynical. Seeking Order In Anarchy examines the phenomenon with first-rate essays by political scientists. The book is timely, in an age of rising nationalism and a receding tide of free trade.